VIDEO: Watch how Spanish police deal with Antifa. Not to police chiefs across America…. THIS is how YOU should deal with Antifa! This should be a training video for police departments across America. THIS is how you handle the lawless scum who call themselves Antifa. From Berkeley to Charlottesville, police have watched as Antifa has been given free rein to injure Trump supporters with clubs, baseball bats with nails in them, and most recently the masked thugs have shown up at patriot rallies armed with AR-15s. It appears the pendulum is swinging a bit more towards law and order now with police making arrests of Antifa goons, but the anarchists are still being allowed to get away with much too much. 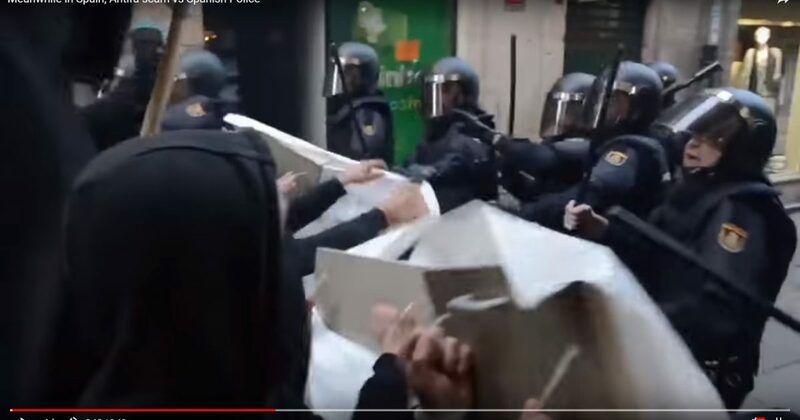 Watch the video, below, to see how Spanish police deal with Antifa.